Park ar Brug is situated in Brittany, in the west country of France, near the city of Guingamp. Brittany is characterised by its very favourable conditions for growing camellias: acid soil and an oceanic climate with mild temperatures all through the year. Camellias are very popular in the peninsula, both in individuals’ home gardens in the villages and also in the parks of the cities. Park ar Brug is a garden of 24 acres (approximately 10 ha) around an old farm sheltered against the winds. 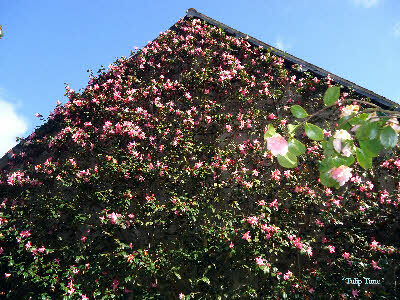 Only camellias have been planted in the garden for the last 50 years. The collection, beginning about 1965, was approved in 1996 by the CCVS (Conservatoire Français des Collections Végétales Spécialisées). 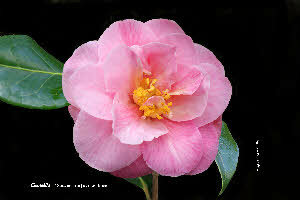 It contains 50 wild species and more than 700 cultivars from all the countries growing camellias. The plants are in their natural shapes, but have been pruned once in the two last years to permit perspectives for the eyes and a good and easy walk for visitors. The great number of species and cultivars and their diversity, combined with the work of the numerous bees present in the garden, means that each year many seeds are produced. Each year, Fanch Le Moal plants 3,000 seeds, and as a result, he is now a famous breeder in Brittany, with many new cultivars, planted in a special part of the garden. The society, "Camellias du Pays de Guingamp", was founded in 1995 to help promote Fanch Le Moal’s Park ar Brug collection during the festivals organized in that town every five years. The first festival in Guingamp was in 1995, and the event has become very popular. The next festival will be in 2015.